The carcass of a humpback whale originally discovered along Turnagain Arm near Hope has washed ashore at Kincaid Park in Anchorage. Scientists already performed a necropsy on the 42-foot whale when it emerged June 28 in an area along the Hope Highway. The necropsy results aren't yet known, said National Oceanic and Atmospheric Administration spokesperson Julie Speegle. The whale's cause of death wasn't apparent, so a team collected numerous samples including internal organs to be tested, Speegle said. It was tied by rope to a tree so the carcass wouldn't wash away while the necropsy was taking place. NOAA decided to cut the remains free, but when officials arrived, someone had beaten them to it, Speegle said. On Thursday, the whale once again re-emerged at Kincaid near the motocross area. The current plan is to leave the whale where it is. "In this situation, we'll wait for the tide to come in," Speegle said. The whale may remain on the beach for some time, she said, because the next full tide will come in early August. Speegle cautioned people not to touch the whale or take any of its remains. She also warned that bears will likely be attracted by the carcass. This is the third beached whale in the past several weeks in southern Alaska. 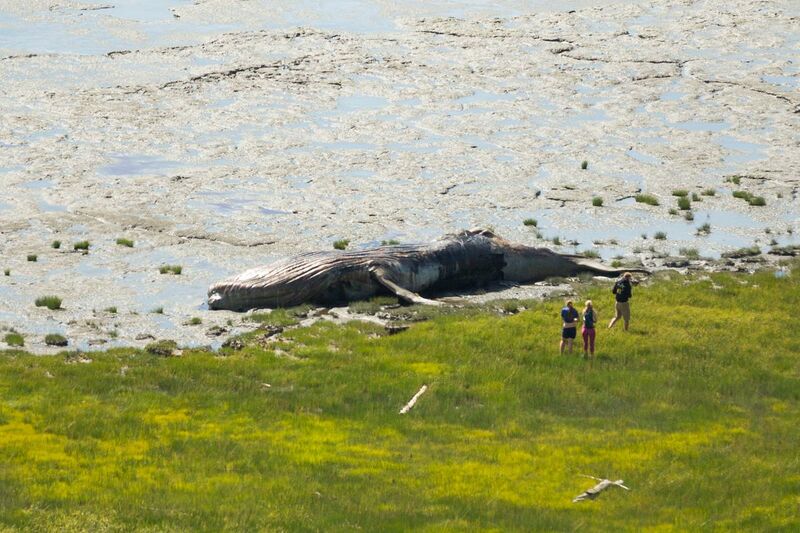 Scientists hope to use the remains of a fin whale discovered in late June in Southcentral to establish any connection between its death and a mysterious die-off of large whales that began last year. In a separate incident, a humpback whale, tracked for 44 years, was also reported dead in Southeast June 26.